AFTER NOV. 7TH YOU WILL NEED TO BRING YOUR OWN LUNCH TO THE RETREAT. IF YOU HAVEN’T REGISTERED, YOU MAY REGISTER FOR THE RETREAT AT THE EVENT ON FRIDAY – DOORS OPEN AT 6:30 PM. If you already have a special registration code click the button below. ONLINE REGISTRATION CLOSES AT 3PM FRIDAY, NOVEMBER 9. AT-THE-DOOR REGISTRATION IS AVAILABLE ON FRIDAY, NOVEMBER 9 BEGINNING AT 6:00PM. Full refunds less a 20% admin fee will be granted for requests made at least one week prior to event. If you are unable to attend, you may transfer your registration to another person. Refunds cannot be granted for the catered lunches. Many today are longing for a rooted faith. We seek a pattern of prayer and worship that fashions depth within our souls and Christian communities, offering an alternative to the often-fruitless distractions and egocentric fulfillments of contemporary life. 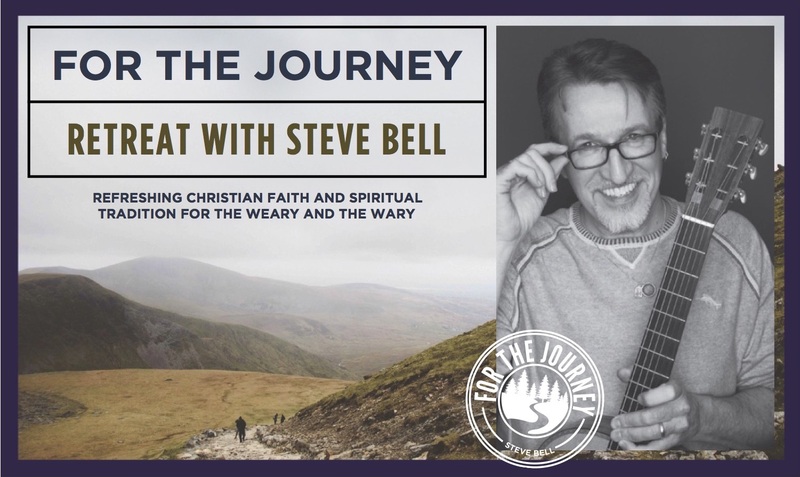 For The Journey Retreat with Steve Bell explores the fertile tradition and spirituality of a Trinitarian faith, navigating a pattern for corporate worship based on Isaiah 6:1-9 in tandem with the Christian calendar year, the Hebrew psalms, and ancient prayers of the church. Practiced together, these theological commitments and devotional praxes “irrigate our souls, soften the ground of our hearts, and nourish the soil of our lives until the seed of the word of God itself begins to grow in us, comes to fruit in us, ripens us in the spiritual journey of a lifetime” (Joan Chittister). “Steve Bell’s music and stage presence embody both the grace and truth of Jesus Christ and translate the depths of the biblical narrative into ways that resonate with our own experience more than anyone else I know. These are profoundly wondrous gifts.” —Dr. Syd Hielema, Team Leader for Discipleship for the CRC denomination in Canada & U.S.
Before we can know how or why we should respond to God, we must ask the more important question: who. Who is God? This first session establishes that God, in God’s very nature, is a communion of mutually self-donating persons, and that we have been made in the image of this God. This understanding is key to discerning the meaning of our worship, our practical love for one another, and our role as stewards of creation. Using Isaiah 6:1-9, Steve lays out a rich, ancient pattern of worship that is both structured and open to innovation, but which helps the worshipping community journey from alienation to intimacy. This session examines the tradition of the Christian calendar year as a storied framework, and discusses how the idea of pilgrimage gives shape to our lives, forming us both as individuals and within Christian community. Using selected songs from Steve’s body of work, this session delves into the treasury of psalms and ancient prayers, as well as the lives of particular saints, considering more deeply how they fashion and nourish the faith community.